"Raghuram Rajan represents the very best of India. Nonetheless, one man can't do everything. You need to have good institutions that work well, even without fantastic, world-class leaders. 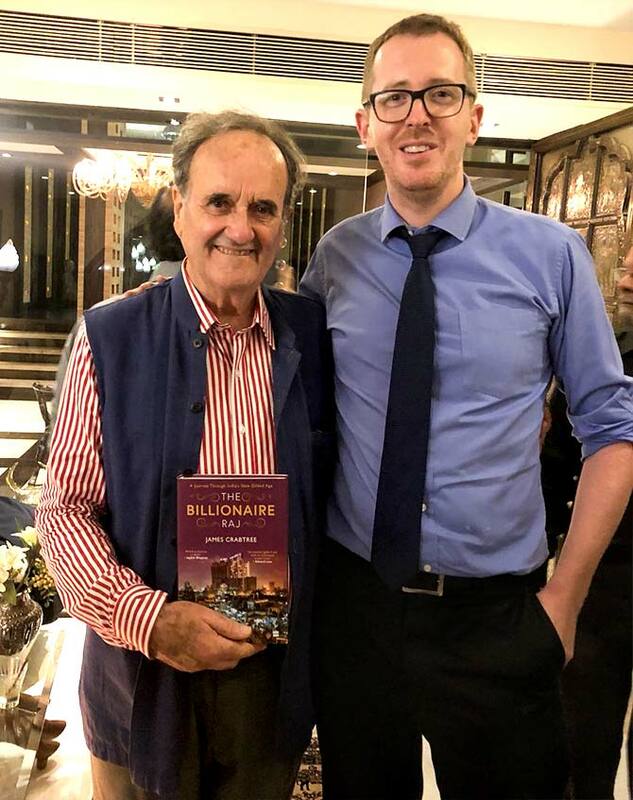 And that's the challenge," James Crabtree, author of the well received book, The Billionaire Raj, tells Rediff.com's Vaihayasi P Daniel in the concluding segment of an eloquent four-part interview. "In the end," says Crabtree, the Financial Times' former correspondent in India, "we need a State that has the capacity to make the decisions that are necessary. You don't want to rely on suddenly some miraculous figure -- sort of dropping from the sky. That is not a good way to run your country." About political funding you said at the discussion on your book at the Nehru Centre: "It was a great disappointment. I really tried to get people to open up about this. It remains the black box of Indian politics. There were little kinds of snatches and shadows of it." "Can guess who some of the people were who told me this stuff. Even the good people are corrupt. You can't be a politician..."
How will a change ever come in this worrying area? What is your sense? In the course of writing this book who was the most interesting person you interviewed? 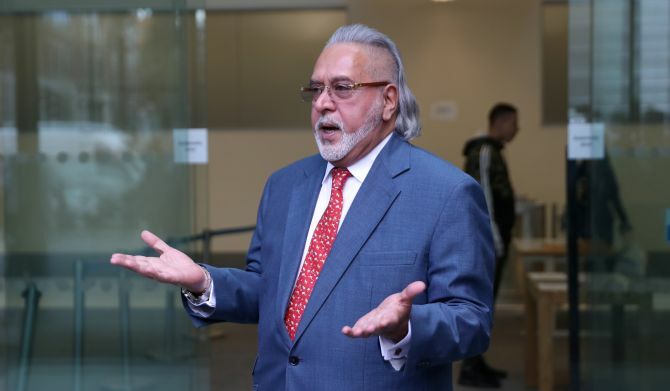 The most interesting person I met, hands down, was (businessman) Vijay Mallya. He was such a phenomenal character and the four hours I spent with him in his house in London, which make up the second chapter of the book, were gold, if you are a journalist. And I don't say that because I tell the story in the book of his golden toilet. He is very talkative, very thoughtful and told me a lot of interesting things. 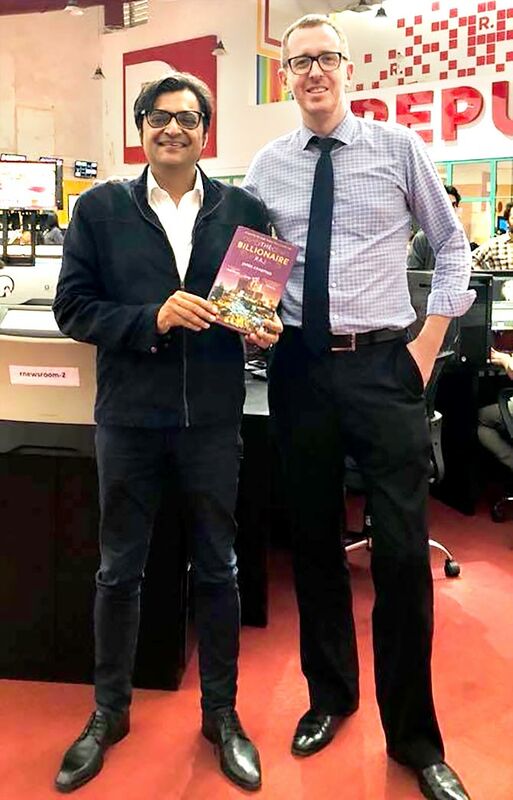 But (his) story -- in a way the three tycoons I deal with in the first chapter, Ambani, Mallya and Adani -- in their own way represent the change that has come over India. It just happens of the three of them, Mallya is the most fun. He was terrific. The people I regret not meeting, the one who stands out is (the late Tamil Nadu chief minister) Jayalalithaa. Would have loved to have met Jayalalithaa. She never gave interviews to anyone. So I tried very hard, but it was just impossible. I wanted to write about her more than anyone because she is such a fascinating figure and I would have loved to have had some insight into what made her tick. You seemed very impressed with former Reserve Bank of India governor, Raghuram Rajan. Almost the danger, for the people like me, the Western foreign correspondent, is that we like people like Raghu too much. In the end Raghu is very -- Governor Rajan as he was known -- is very impressive. He is very clever, an immensely thoughtful guy. I think he represents the very best of India. Nonetheless, one man can't do everything. You need to have good institutions that work well, even without fantastic, world-class leaders. And that's the challenge. In the end we need a State that has the capacity to make the decisions that are necessary. You don't want to rely on suddenly some miraculous figure -- sort of dropping from the sky. That is not a good way to run your country. You should be able to have normal people and good institutions is better than spectacular people and bad institutions. That's where you want to be. I am a big admirer of Governor Rajan and I owe an intellectual debt to him. Many of the ideas that are in the book came from his speeches. His speeches were full of interesting ideas, in a way that most central bankers simply aren't. 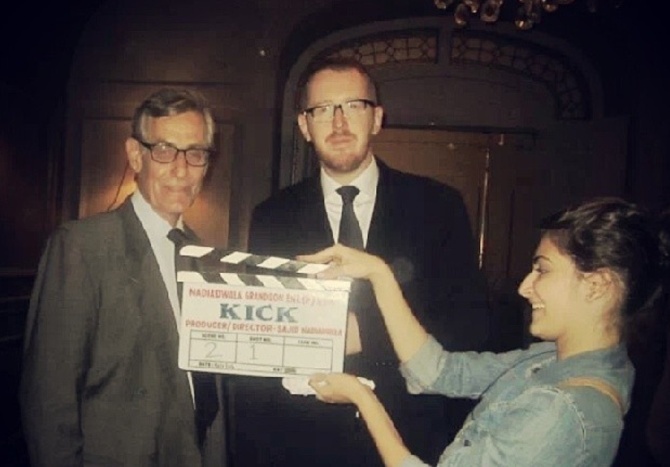 IMAGE: During his posting in Mumbai James Crabtree was delighted to star in the Bollywood film Kick. 'The casting call came one Wednesday morning in early February, from a writer friend in Mumbai: "Would you like a part in a Bollywood movie?" "Of course," I said, "but you know I've never acted?" "Not a problem: They just need a tall English guy, for an office scene. Are you free on Friday?"' Crabtree recalled in an FT article. How come the 'tycoons' of Bollywood didn't figure in The Billionaire Raj? None of them are really worth serious money. I profiled Ronnie Screwala when I was at the FT. Great guy. Any political figure from your book that you admired the most? And why? I admire many Indians in public life who stand up for good governance and high quality public administration. Raghuram Rajan and Vinod Rai (the former IAS officer who served as the comptroller and auditor general of India) both fit this mould. In your book you spoke about the three fault lines India is facing. At the Nehru Centre and in The Billionaire Raj, the importance of building good institutions was stressed. People are often critical about civil servants, but often it is civil servants maintain the continuity in India. Who are the people who you think are going to build these institutions, bring in health care and education? Who are the actual people who are going to do all this? Finally, it is in the hands of these politicians and civil servants. To some degree, you need a well-functioning political and bureaucratic elite. You need big businesses that can build infrastructure. But democracies are responsive to their people. Politicians want to give the people what the people want and so, to some degree, things like India Against Corruption was a very powerful moment and it had a huge effect. Corruption hasn't been driven out of the Indian political system, but that outpouring of anger in 2011 and 2012 made a big difference in the way that the country runs, some for the good, some for the bad. In addition to the fact that India needs a government that has greater capacity to reform and a business elite that moves beyond some of the fault lines, that I identified in the book, the democratic impulse from a larger, more prosperous middle and lower middle class in particular will have quite a powerful impact on Indian politics. 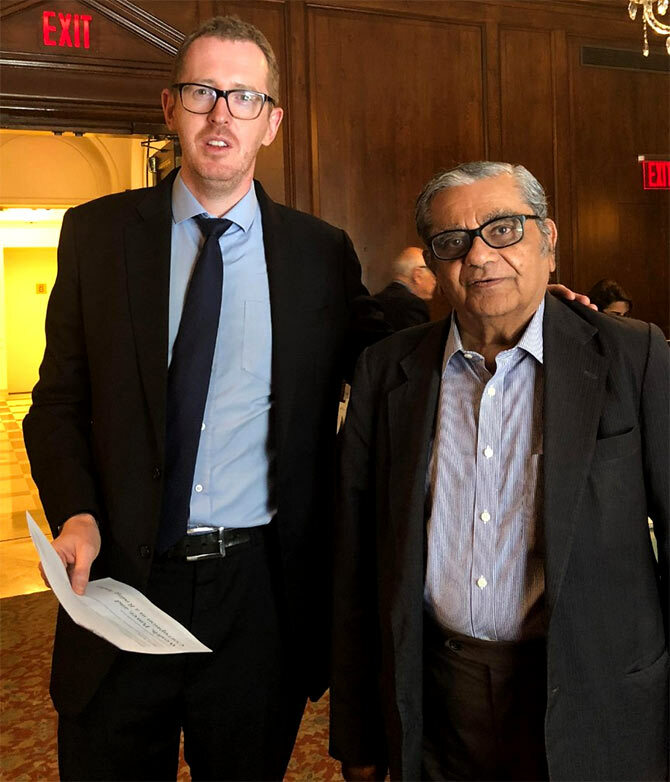 IMAGE: James Crabtree with economist Jagdish Bhagwati. Columbia professor Bhagwati and Nobel Laureate Amartya Sen were interviewed in the book. So you feel citizens movements influence? Simply the act of voting in an election. In the end, politicians are responsive to their voters. By sheer dint of their vote? And a voter being aware of the issues facing him? Not just that. In the end, reform movements come from lots of different places, some of them are driven by technocrats and some of them are driven by ordinary people who are pissed off. India will have both of those things I think. If it is going to modernise in a way that it needs to, and most of its people want it to, then, in a sense, all of those things are going to have to work together.